Members of the Bourn Vincent family and their staff at Muckross, 18 July 1916. Front sitting from left: William Bowers Bourn, Maud Vincent with daughter Rosie, Agnes Bowers Bourn and Arthur Rose Vincent. Thomas Greany, unknown woman, Jack O’Connor, Mrs Thomas Greany, Mr Bennett, Mick Doody, Maurice R. Moriarty and Mr Murhill. MP for County Kerry, 1806-1813 The Herbert family connection with Kerry began in 1656. In that year, Thomas Herbert of Montgomery in Wales was appointed land agent for his cousin, the third Lord Castleisland. Thomas settled at Kilcow, near Castleisland and his son, Edward, later leased the lands around Muckross from the native MacCarthys. Edward's son, also called Edward, may have been the first member of the Herbert family to actually live at Muckross. Certainly he was living on the Muckross Peninsula in 1735 with his wife Frances, a sister of Lord Kenmare. The Herbert family became very wealthy during the 18th century due to the working of the copper mines on the Muckross Peninsula. However, it was not until 1770 that the family became the actual owners of the lands at Muckross, following the death of a MacCarthy relation. The Herbert family played an active role in both local and political life as part of the 'Establishment'. They were also enthusiastic land improvers. When Arthur Young visited Muckross in 1776 he was fulsome in his praise of the agricultural improvements initiated by the then owner, Thomas Herbert. His son, the first Henry Arthur Herbert, was responsible for extensive plantations of forest on Torc Mountain. He served as M.P. for Kerry from 1806 to 1813. 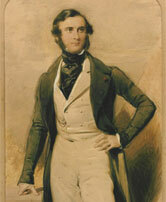 Charles Herbert succeeded his father, Henry Arthur Herbert, in 1821. 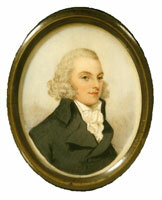 However, He died shortly after, in 1823, leaving his widow, Louisa Middleton, with six young children. Louisa then moved, with her children back home to Bradford Pererell in Dorchester. Their eldest son, also called Henry Arthur Herbert, was only thirteen years old when his mother died five years later. 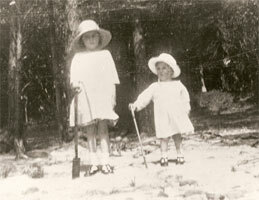 Three of the Herbert children, from left to right, Charles (b. 1842), Henry (b. 1840) and Eleanor (b. 1839). By D. McDonald, 1845 Henry Arthur Herbert was educated at Eton and graduated from Trinity College, Cambridge in 1835. While visiting Rome as part of a European tour he met his future wife, Mary Balfour, daughter of James Balfour and Lady Eleanor Maitland. Henry Arthur and Mary were married in 1837. They returned to Muckross where they initially lived at Torc Cottage (now demolished), in the shadow of Torc Mountain. In 1839 they commenced the building of the present Muckross House. It was completed in 1843, just two years prior to the Great Irish Famine. Henry Arthur and Mary had four children, Eleanor, Henry Arthur, Charles and Blanche; they spent most of the famine years in England. Their parents however, tried to alleviate conditions for their tenants as best they could. Henry Arthur was elected to Parliament in 1847. He was appointed Lord Lieutenant of the County of Kerry in 1853 and Colonel of the Kerry Militia in 1854. In 1857 Palmerston selected him as Chief Secretary for Ireland. However, he held this office for only a brief period. The Colonel remained an M.P. for Kerry until he died in 1866. He is buried in Killegy graveyard, close to Muckross village. Following his death, Mary and her two daughters retired to live in London. Major Henry Arthur Herbert succeeded his father, the Colonel. Soon after, he married Emily Julia Charlotte Keane from County Waterford. The marriage was not a success and the couple divorced in the early 1880s. 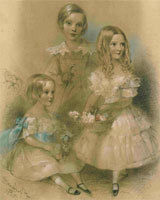 They had three children, Henry Arthur Edward Keane Herbert, Kathleen Keane Herbert and Gladys Keane Herbert. 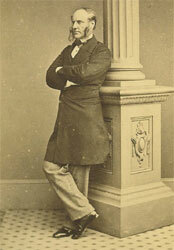 Colonel Henry Arthur Herbert (1815-1866). 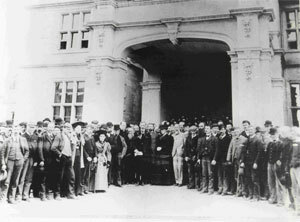 Members of the Herbert family and their tenantry, photographed outside Muckross House, probably 1896 The Herbert's financial situation appears to have become increasingly unstable during the latter part of the 19th century. The visit of Queen Victoria in 1861 may have contributed to this. However, it is also likely that a reduction in rents, coupled with a number of possible ill-advised investments, may have aggravated their problems. In 1897 the Herberts were refused any further loans from the Standard Life Assurance Company. A year later, the Estate was forfeited to that Company and the long association of the Herbert family with Muckross was ended. But that is not the end of the story. In September 1999 a Herbert family reunion, organised by the Trustees of Muckross House, was held at Muckross. It was the first time in one hundred years that Herbert family members had gathered together at Muckross. The family members now include widely scattered descendants, from both England and America, many of whom were previously unaware of each other's existence. It gives us great pleasure to think that we were instrumental in reuniting the various strands of the family again. An exhibition of watercolours by Mary Herbert, wife of Colonel Henry Arthur Herbert, was mounted for this special occasion. 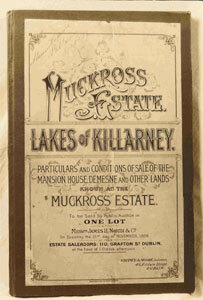 Front cover of the prospectus for the sale of the Muckross Estate, 1899 The Standard Life Assurance Company placed Muckross House and Estate for sale at auction in Dublin on the 21st November 1899. However, bidding was slow and the vendors withdrew the property. Then, on November 29th, it was announced that Lord Ardilaun, a member of the Guinness family and a prominent Irish Unionist, had finally purchased the Estate. Lord Ardilaun was related through marriage to the Herbert family. His wife Olivia was a daughter of Jane, Countess of Bantry. Jane was the youngest sister of Colonel Henry Arthur Herbert. The Ardilauns spent very little time at Muckross and it was let out on an annual basis as a shooting and fishing lodge. 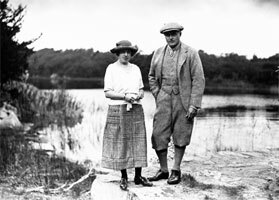 Maud Bowers Bourn Vincent and her husband Arthur Rose Vincent. 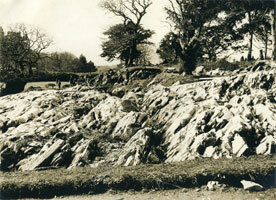 Muckross, c. early 1920s In 1910 Muckross was let to a wealthy American, Mr William Bowers Bourn. He was owner of the Empire Gold Mine and Spring Valley Water Company of northern California. A short time after, Mr Bowers Bourn's only child, Maud, married Mr Arthur Rose Vincent of Summerhill, Cloonlara, Co. Clare. Her father purchased the Muckross property as a wedding present for them. Maud and her husband, Arthur Rose Vincent, had two children, Elizabeth Rose (1915 - 1983) and Arthur William Bourn (1919 - 2012). The family travelled extensively, but Muckross was their home. During the years of Bourn and Vincent ownership, between 1911 and 1932, over £110,000 was lavished on improvements to the Estate. In 1915 the Sunken Garden, designed by Wallace and Co. of Colchester, was laid out. The Rock Garden was developed on a natural outcrop of Carboniferous limestone and the Stream Garden was also landscaped. It is interesting that the Bourns chose a site which reminded them of Killarney, when they were building 'Filoli', their Californian home (1916 - 1919). There, they decorated their ballroom with murals depicting scenes from around Muckross. The gardens at 'Filoli' were planted with clippings of Yew, Holly and Myrtle, also from Muckross. Prior to his marriage, Mr Vincent had served as a judge in the British Colonial Service. Afterwards, he continued to play an active role in public life. He served as Deputy Lieutenant of County Kerry in 1914 and was then appointed High Sheriff in 1915. In addition, he served as a Justice of the Peace. Mr Vincent had sustained a hip injury when young. As a result, he was considered unfit for military service during the Great 1914 - 1918 War. However he did volunteer and serve as an ambulance driver with the French army on the Western Front. The United States entered the War in 1917. The British Foreign Office then dispatched Mr Vincent to head the British Information Service in Chicago. Rock garden under development at Muckross During the Irish War of Independence (1919 -1921) Mr Vincent appears to have served as an 'honest broker' between the IRA and the British Government. He was appointed to the Senate of the Irish Free State in 1931 and resigned in 1934. Maud had died of pneumonia in New York in February 1929. She had been on her way to visit her parents in California. Her husband and children continued to live at Muckross for a further three years. In July 1932 Mr Vincent wrote to Mr Eamon De Valera, President of the Executive Council of the State. He stated that it was his intention, in association with his parents-in-law, to present Muckross to the Irish nation. With his parents-in-law, Mr Vincent had come to the conclusion that sustaining Muckross was going to become too big an undertaking for any private individual. The Bourn Vincent Memorial Park Bill was put before Dáil Éireann (Irish Parliament) on December 7th 1932 and it took effect on December 31st. Under this Act, the Commissioners of Public Works were required to 'maintain and manage the Park as a National Park for the purpose of the recreation and enjoyment of the public'. Following its acquisition by the State, Muckross House remained closed until 1964. Despite this, the Park and Gardens were open to the public and were visited by large numbers of visitors every year. Arthur Rose Vincent continued to retain a lively interest in Muckross until his death in 1956. Like Henry Arthur Herbert he is buried in the nearby Killegy graveyard. His son, Arthur William Bourn Vincent, has always maintained close ties with Muckross throughout his life. Fleur Melville Gardner (daughter of Elizabeth Rose Vincent and niece of Arthur William Bourn Vincent) was a frequent visitor to Muckross until her untimely death in February 2011.